Simply an electroencephalogram (EEG) is the representation of electrical activity of brain. By using different types of EEG electrodes, EEG is taken and the picked up signal is conditioned to make it suitable for recording and analysis. The EEG is of prime importance in medical cases. The signal conditioning is required because the picked up EEG signal will be having very minute amplitude levels. The different stages of EEG recording are shown below. Commonly used scalp electrode consists of Ag-AgCl disks with long flexible leads that can be plugged in to the amplifier. Advantage of this type of scalp electrode is that they can accurately record even very slow changes in potential. When we use Ag-AgCl scalp electrodes the space between the electrode and skin should be filled with conductive paste. This paste also helps to stick. Usually needle electrodes are used for long measurements and here a needle is invasively inserted under the scalp. Ag-AgCl solution can also be used with disposable electrodes .Disposable EEG electrodes eliminate need to clean, maintain and store after each use. 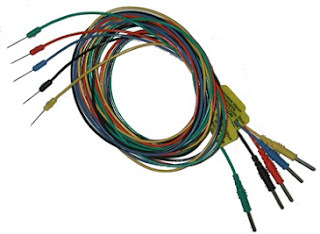 The Ag-AgCl sensor and free wires result in a consistent high quality signal. The electrodes are discarded after one time use. Photographs of reusable EEG electrode and needle electrode are shown in below figures. The most popular scheme used in the placement of electrode for the EEG pick up is the 10-20 electrode placement system. As the cranial area is divided into four main regions, the electrodes are placed accordingly in the different regions. Main regions of cranium are frontal , parietal, temporal and occipital regions. The electrodes placed in each region is denoted as F (Frontal ), P (Parietal ), T(Temporal) and O(Occipital). The 10-20 electrode placement system is internationally used. In this set up the head is mapped by four standard points. They are nasion, inion and left and right ears. The 10-20 electrode placement system is shown below. In 10-20 electrode placement system we use 20 electrodes. One electrode is used for grounding the subject. The electrodes may be uni-polar or bipolar. 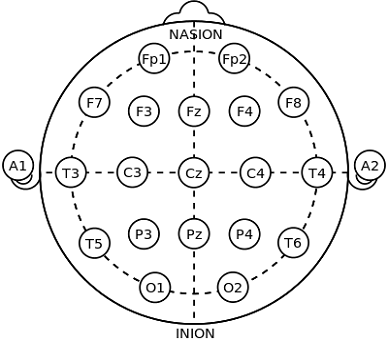 In a unipolar arrangement, one of the electrodes is takes as common to all channels. So to measure the bioelectric potential from brain, we use any one of the nineteen electrodes and, the common electrode. Scalp electrodes or needle type of EEG electrode can be used. If electrodes are to be used under the skin needle electrodes are used. In a bipolar system any of the two electrodes is used for the measurement. 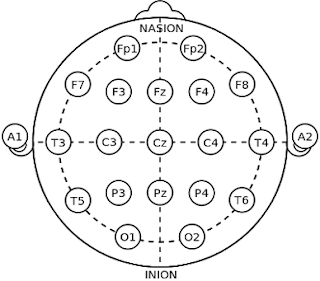 Here before placing the electrodes the nasion-inion distance is measured. Then points are marked on the shaved head at 10%, 20%, 20%, 20%, 20% and 10% of this length. Then the electrode is placed on these points. Hence this system is called 10-20 electrode system. EEG signals are having very low voltage amplitude Ievels. The voltage ranges from (1 - 100) microvolts. These are also having very low frequencies ranging from about 1 Hz to 100 Hz. The EEG waveform differs in their shapes and they show dramatic changes to the different stages of sleep. Hence they are called EEG sleep patterns, Hence we have to use high gain, high CMRR input preamplifiers in order to boost these signals. The details of five different categories of EEG bands are shown below.